In 1832, the HMS Beagle arrived at Bahia Blanca, Argentina and Charles Darwin disembarked. On his way to Buenos Aires, Darwin collected several fossils of large mammals along with many other living organisms, including several insects. February 12 is Darwin's birthday scientists and scientists have named after him a long lost but new to science beetle genus and species from his collection. 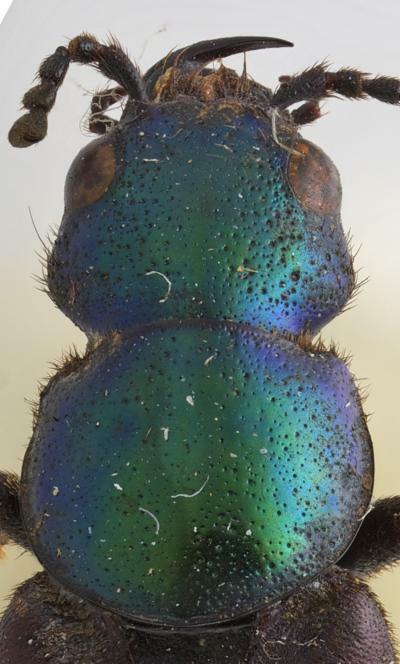 The beetle was discovered and described by Dr. Stylianos Chatzimanolis, an entomologist at the University of Tennessee at Chattanooga as a new genus and species of rove beetles, a group of insects with more than 57,000 described species. How can this only be described 182 years later? The Natural History of Museum, London, isn't all that organized and this wasn't know about until 2008. Chatzimanolis received insects on loan from the Museum and discovered this one. "Finding a new species is always exciting, finding one collected by Darwin is truly amazing." The scientific name for the new species is Darwinilus sedarisi. The genus name (Darwinilus) was given in honor of Charles Darwin, while the epithet (sedarisi) was given in honor of American humorist and radio contributor David Sedaris. Only two specimens are known for this new species, both collected before 1935. Most of the region where the species is found has been transformed into agricultural fields.